This post was originally published in 2016 and has been updated with the latest ideal image sizes for the various social media platforms, as of August 2017. One last thing: How exactly should your image look so it fits in the News Feed, timeline or stream? There’s so much to consider in creating great images for social media — for me, the size and shape tend to get locked in before I even realize what’s happened. 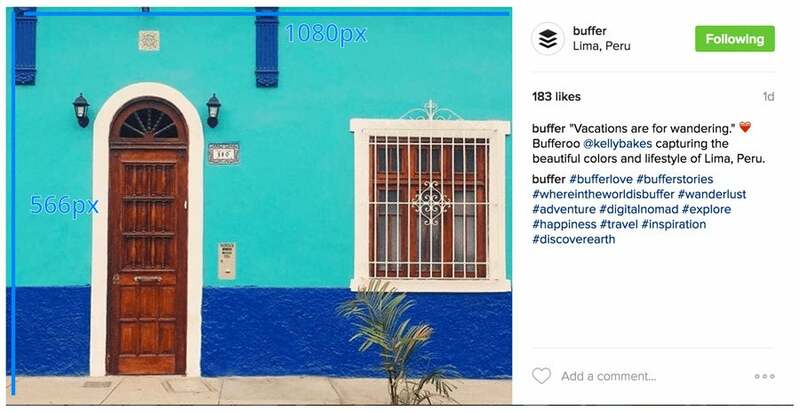 Yet the size and shape — the height, width and orientation — are the elements that most influence how an image will appear in a social media stream. Most of the major social media channels like Facebook and Twitter now give you added control over how your profile picture and cover photo look. You get some really neat tools to resize and scale these pictures until they’re pixel perfect. For ideal sizes on cover photos and profile pictures, I’d highly recommend the site mentioned above. It has got it all covered. We’ve long been interested in the impact of social media images for engagement, retweets, clicks and more. We found that tweets with images receive 150 percent more retweets than those without. One of the big questions for me is how you get an engaging image to look its best when it’s in a stream, timeline or News Feed? What’s the best — and maybe even the easiest — way to go about it? 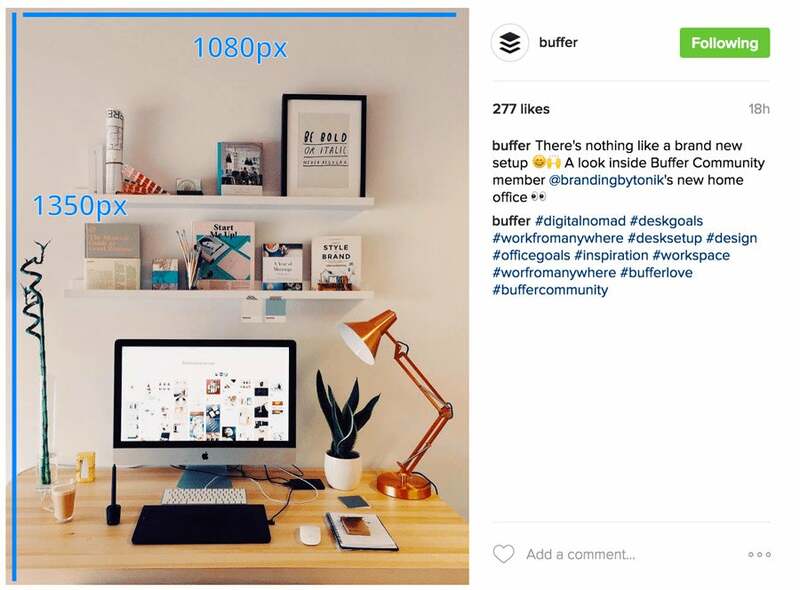 In general, here are the best sizes for sharing images on social media. One of the simplest ways we’ve found for creating the 1,024 x 512-pixel images is to use Pablo. You can create an image in under 30 seconds and share directly to Twitter, Facebook and Buffer. 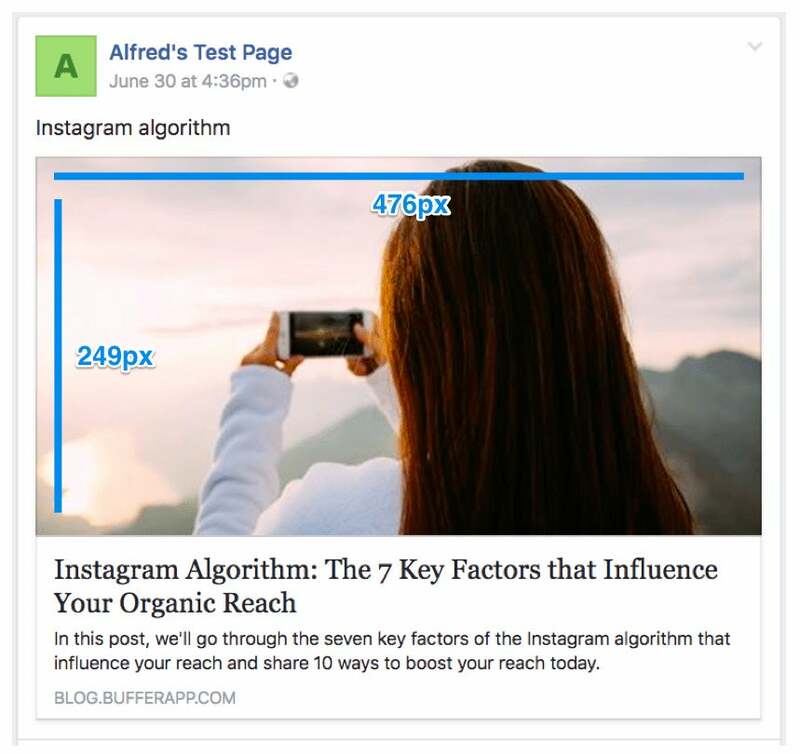 We use the horizontal size for sharing to Facebook, Twitter, LinkedIn and Google+. We use the vertical size for sharing to Pinterest. The horizontal size isn’t quite spot on. But that’s alright because, as you’ll read below, most platforms now adjust the height of the images accordingly without cropping the images. Even when they do crop, we’ve found that it’s close enough where no important bits get cropped. 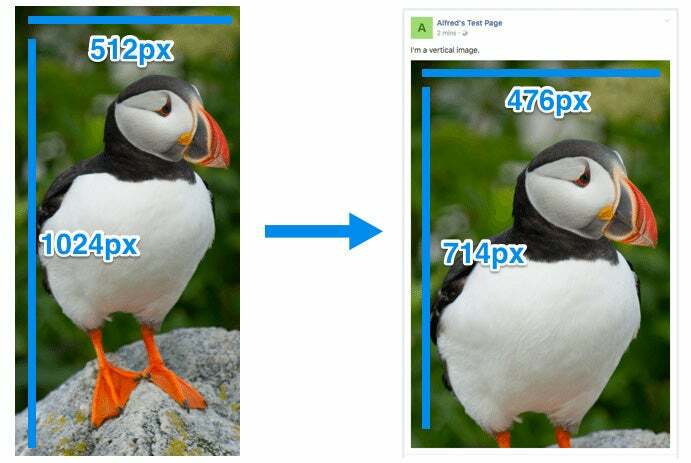 The orientation of your image — whether it’s horizontal (landscape), vertical (portrait) or square — will determine which dimensions Facebook uses to show your image. 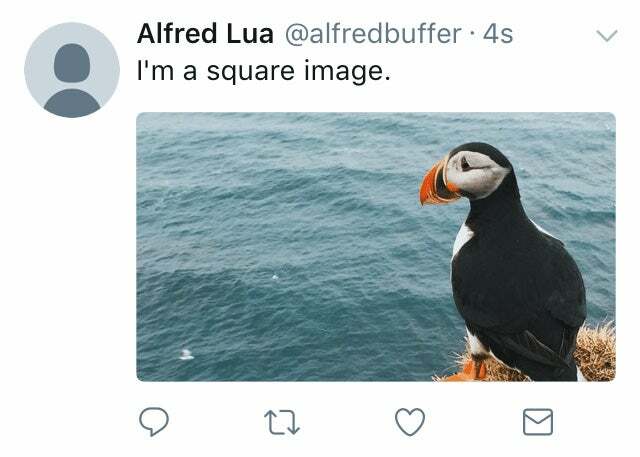 If you upload a square image to share, it will be 476 pixels square. This’ll be the case no matter what size square you upload, be it an 800 x 800 image or a 400 x 400 image (the smaller images might appear a bit blurry when they are sized up to 476 pixels square). If you upload a horizontal (landscape) image, it will be scaled to 476 pixels wide and the height will be adjusted accordingly. If you upload a vertical (portrait) image, it will be scaled to 476 pixels wide and the height will be adjusted accordingly but to a maximum of 714 pixels tall. 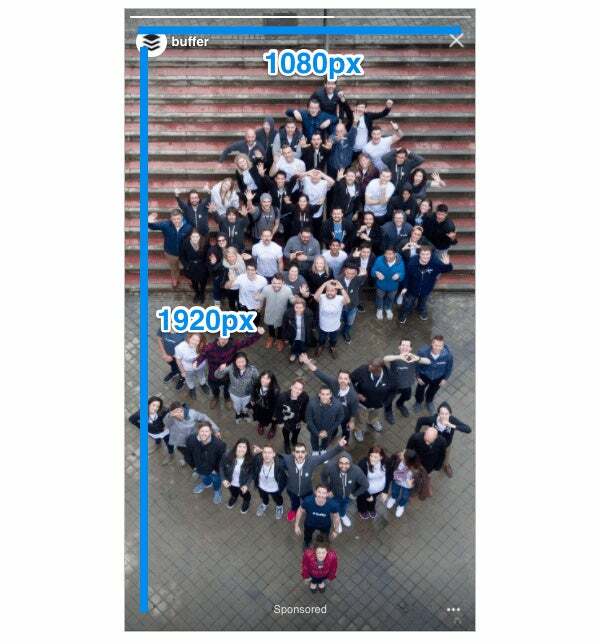 Facebook will crop away the bottom of the image beyond the 714 pixels. If you share a link to Facebook, the image associated with the link can be displayed in a number of ways. Again, all depends on the image size (pixel width and height) and shape (orientation). Images previews for shared links are scaled to fill a box of 476 pixels wide by 249 pixels tall. When choosing an image to go along with a link, Facebook looks at the Open Graph tags for a page, specifically the og:image tag, which specifies the image that Facebook should use when sharing in the News Feed. If you are creating an image to be used in the og:image tag for your link, keep in mind that anything outside of 476 x 249 pixels will be cropped from the top and bottom in order to fit. Additionally, if the link you share does not have the proper og:image tags installed or the image in the tag is not large enough, Facebook will not display it full-width or might not display an image preview at all. If it does, a thumbnail image will be placed in a small box to the left of the link text. For most all image orientations — square, horizontal (landscape) and vertical (portrait) — the thumbnail will be scaled and cropped to fit a 158 x 158-pixel square. If you add multiple images to a link post, Facebook will automatically convert it into a carousel post. Each image is cropped to fit a 300 x 300-pixel square. 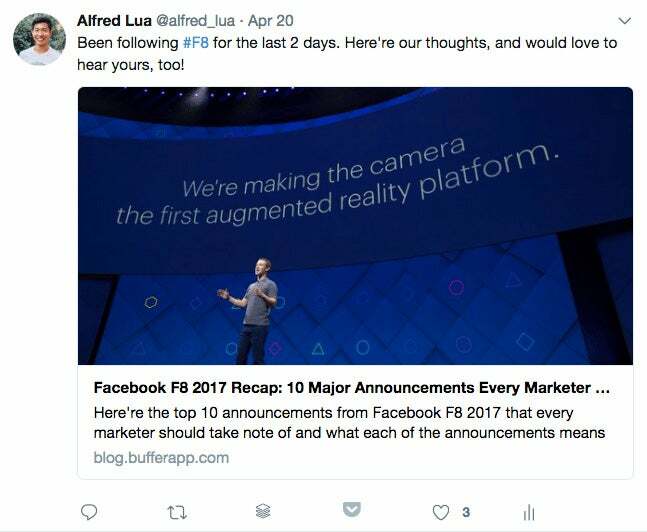 What we’ve found to be a great solution for creating and sharing images to Facebook is to build an image that is 1024 x 512. While this doesn’t quite fit the dimensions above perfectly, it is large enough to look great on retina displays (where the pixel density is greater) and large enough so as to fit with the full-width areas in the News Feed. If you want to make sure that your photos display in the highest possible quality, Facebook has some advice for you. Twitter images used to appear on the timeline at 506 pixels wide by 253 pixels tall. 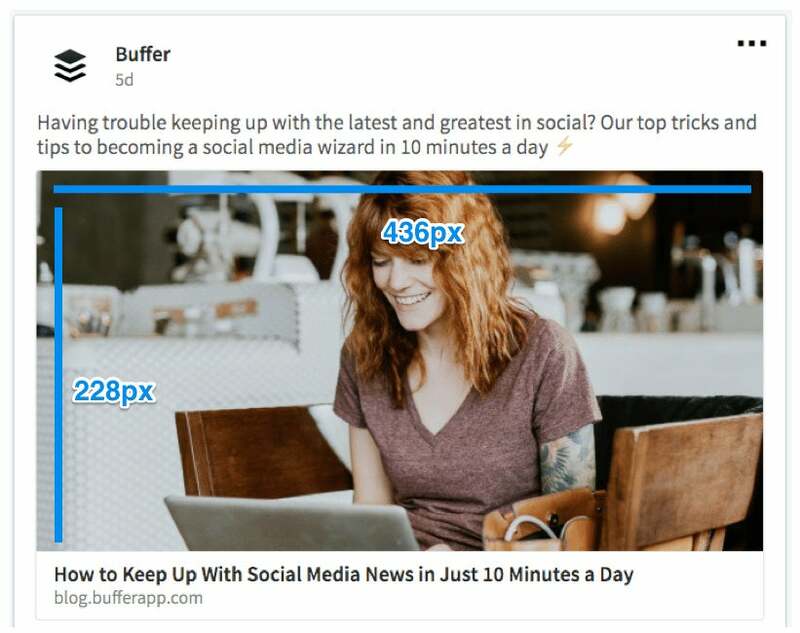 Now, Twitter images appear bigger and less cropped when viewed on a desktop. On the desktop, regardless of the orientation of your image — horizontal (landscape), vertical (portrait) or square — it will be scaled to 506 pixels wide and the height will be adjusted accordingly but to a maximum of 747 pixels tall. The top and bottom of the image will be cropped away. So a square image will nicely take up all the space available. But if you upload an image that is smaller than 506 pixels wide by 253 pixels tall, there will be a whitespace to the right of the image. Twitter also allows you to upload up to four images to each tweet. The images used to be displayed as four equal horizontal rectangles but now, they are cropped into squares and the first image you upload will appear bigger. The remaining images will also be scaled and cropped into squares. Images are also present in each of the nine different Twitter Cards. 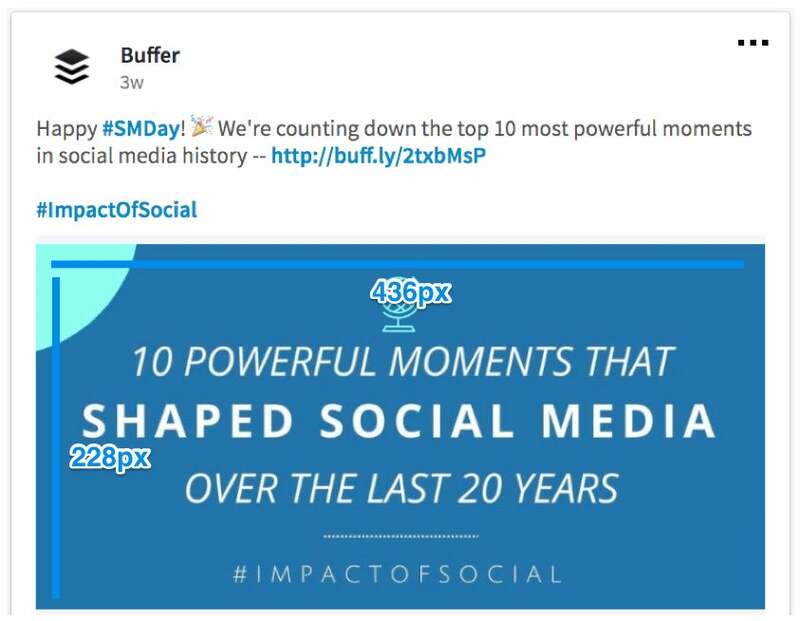 If you’re interested in trying out something like a lead generation card or a product card, Twitter did a great job of breaking down the images sizes for each type of card. I’d like to get a bit deeper into a couple of specific ones that seem key for content sharing. 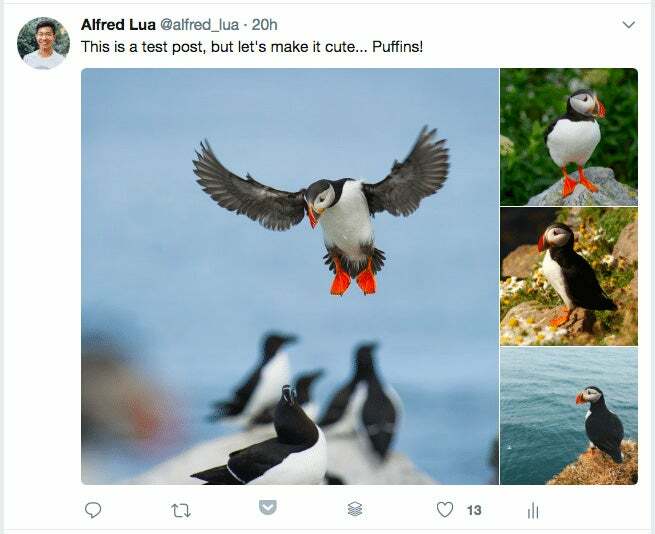 Summary cards show a headline, description, link, and photo when you share a URL from a site that contains the appropriate Twitter Cards code. All this information is pulled via HTML tags, often the same ones that are being used by Facebook to display links. 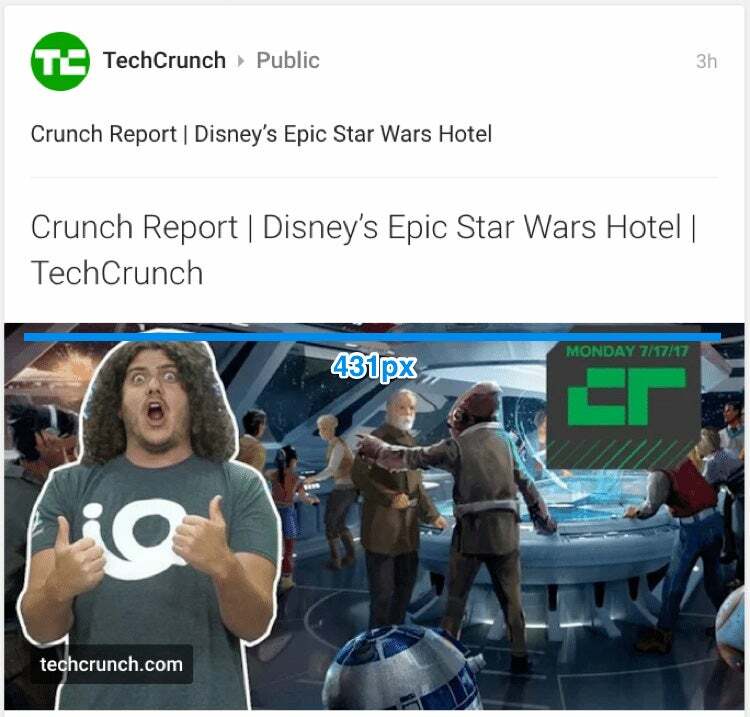 Each type of summary card contains a thumbnail or featured image. The thumbnail photos that appear on one’s profile page are 293 pixels wide by 293 pixels tall. Instagram stories are displayed at an aspect ratio of 9:16. So the ideal size for Instagram stories is 1080 pixels wide by 1920 pixels tall. According to a moderator of LinkedIn’s help forum, the ideal image size is 522 pixels wide by 368 pixels tall. If you upload an image directly, the image will appear at a maximum width of 552 pixels and a maximum height of 368 pixels. The image will be cropped to fit this box. It seems that if you upload a landscape image, LinkedIn will scale it to a height of 368 pixels and crop the sides. If you upload a portrait or square image, LinkedIn will scale it to a width of 552 pixels and crop the bottom of the image. 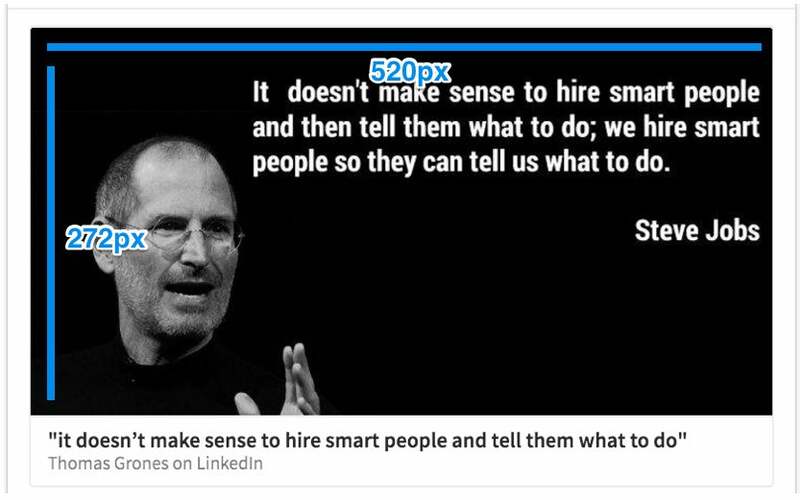 When you share links and articles to LinkedIn, the image preview will be scaled and cropped to fit a box of 520 pixels wide by 272 pixels tall. Images shared to your LinkedIn Company Page will look slightly different than images shared to your personal profile. Images will be scaled to fit into a 436-pixels-wide-by-228-pixels tall rectangle. 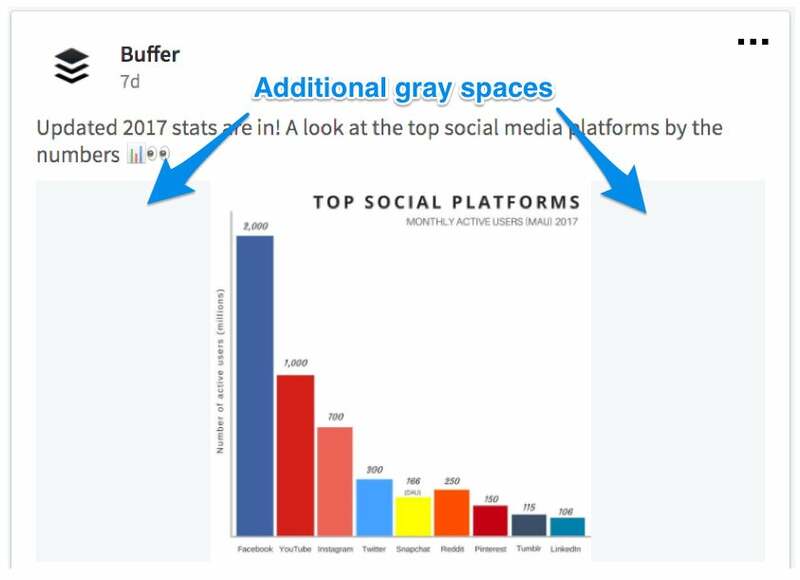 LinkedIn doesn’t seem to crop images when they don’t fit that box. It scales the images and adds gray spaces accordingly. If an image is too wide (e.g. landscape), LinkedIn will scale it to 436 pixels wide, adjust the height accordingly and add gray spaces to the top and bottom of the image. If an image is too tall (e.g. 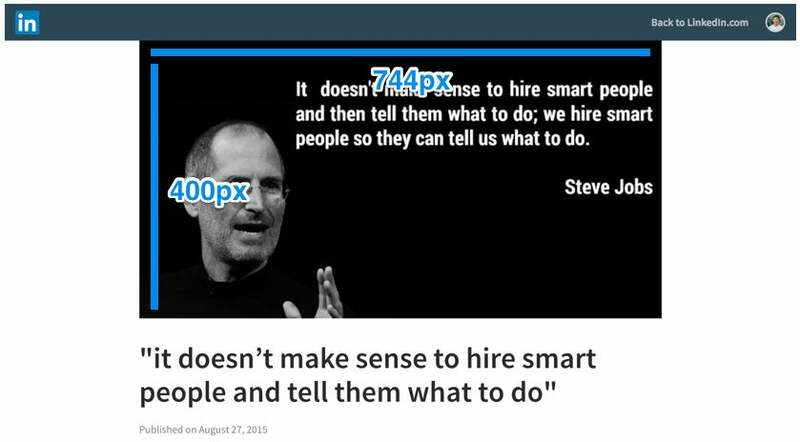 square or portrait), LinkedIn will scale it to 228 pixels tall, adjust the width accordingly and add gray spaces to the left and right of the image. When links are shared to your Company Page, the image preview will be scaled and cropped to fit a box of 436 pixels wide by 228 pixels tall. This is a different size from when links are shared to your personal profile. The good news? It’s almost the same aspect ratio as the image preview of links shared on your personal profile. 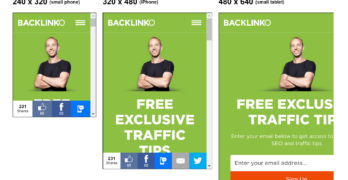 So the same image should scale nicely for both image previews of links on your personal profile and Company Page. On these pages, images and image preview for links will appear in a box of 366 pixels wide by 191 pixels tall (roughly the same aspect ratio as those above). Images will be scaled and gray spaces will be added accordingly. Image preview for links will be scaled and cropped to fit the box. According to eDigital, the ideal image size for your LinkedIn Company Page is 1200 pixels wide by 628 pixels tall. 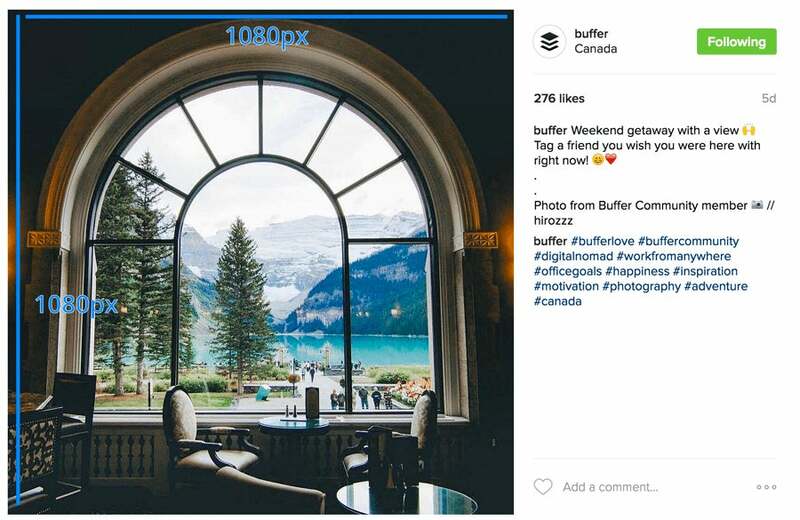 This size seems to work great for all the various image types — images on your personal profile, Company Page and Showcase Pages. LinkedIn uses the same Open Graph tags as Facebook and other social networks. If you’ve got your site well-optimized for Facebook links, then you should be good to go for LinkedIn as well. One additional way to share content on LinkedIn is by publishing articles that appear on people’s home pages. LinkedIn built a substantial publishing platform for this content, which includes the ability to add featured images to the articles. 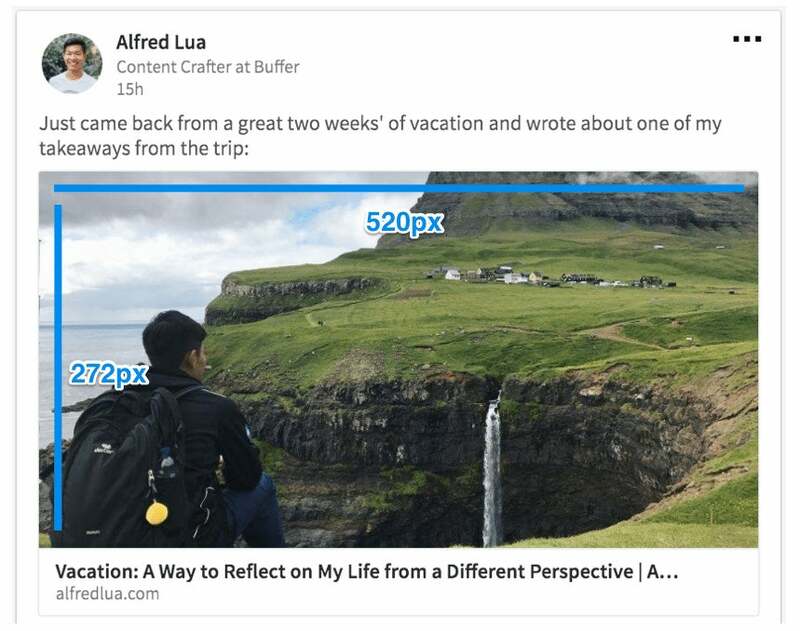 In the home page feed, the featured image on a LinkedIn article has the same size as that of a link shared on LinkedIn — 520 pixels wide by 272 pixels tall. The recommended size for the cover image at the top of the article is 744 pixels wide by 400 pixels tall. There are a couple of different places where a Pinned image can appear on Pinterest. 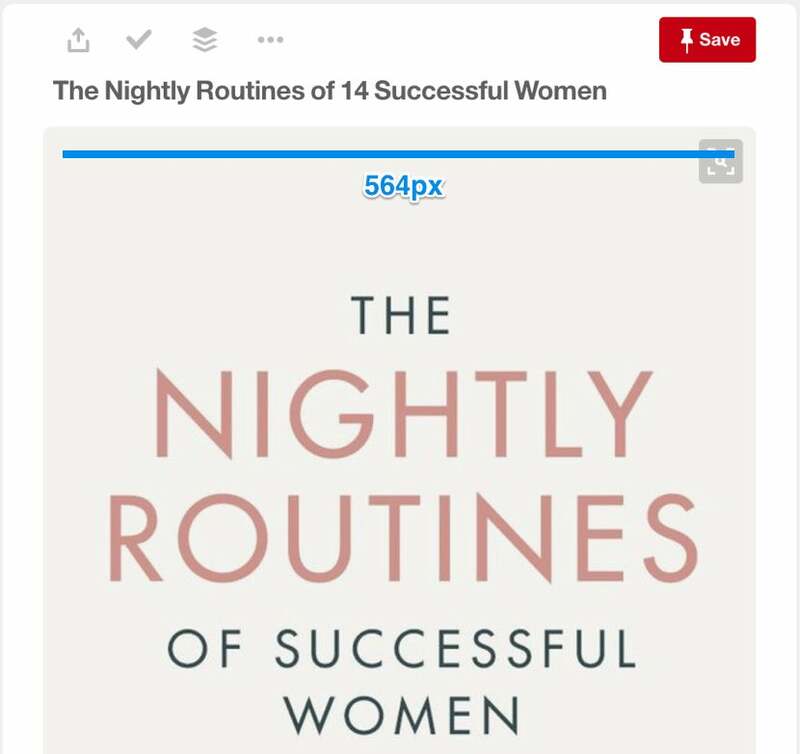 In the feed, Pinterest images have a width of 236 pixels. The height scales accordingly, to a maximum of 800 pixels. If a user clicks to expand, the cropped portion of the image will appear. If you click to expand a Pinned image, the image will have a width of 564 pixels. The height, again, scales accordingly. Beyond these two places, the other spots that you might find a pin include the cover for Pinterest boards and in side ads for recommended and related Pins. According to Pinterest, the best aspect ratio for Pinterest images is 2:3, with a minimum width of 600 pixels. So this might raise the question (one that I’ve asked a lot before): What is aspect ratio? It’s how the width and the height of an image relate to one another. If you upload an image directly to Google+, the image will appear on the feed at a maximum width of 431 pixels. The height of the image will scale according to the new width. Clicking through to the update URL, the image will be 530 pixels wide, maximum, with a height that scales accordingly. When you share links and articles to Google+, the featured photos appear at a maximum width of 426 pixels also (same as above). The height scales accordingly. must have an aspect ratio no wider than 5:2. From that, I think it’s safe to say that 800 pixels wide by 320 pixels tall will be an ideal image size for Google+. Similarly to the other social channels mentioned here, Google+ pulls in images from URLs using Open Graph tags. 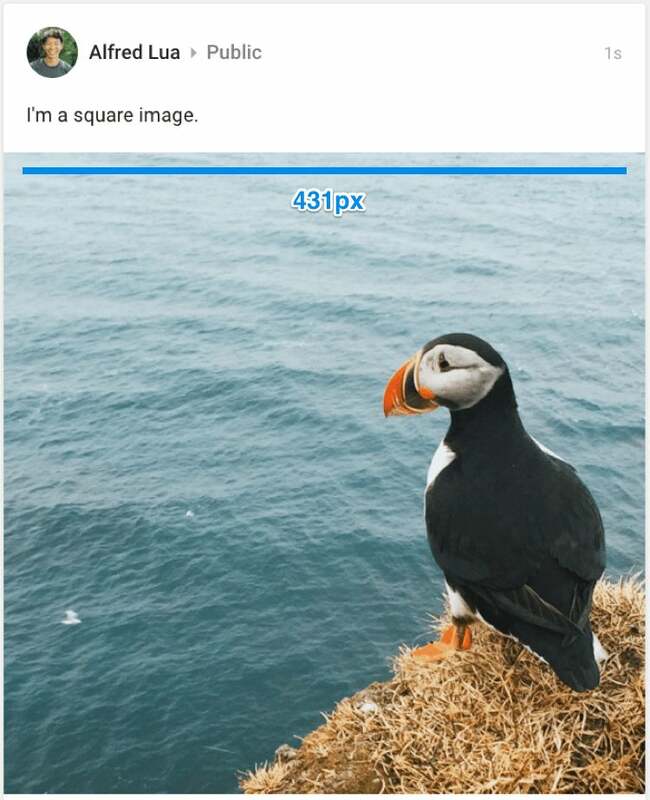 If the image used in the Open Graph is not at least 400 pixels wide or if Open Graph tags do not exist for a URL, Google+ may instead place a thumbnail image to the left of the update. This thumbnail is 110 x 110 square. Business outings aren’t some new, revolutionary invention. However, the ordinary business outing could sure use some variation and originality. Many workplaces embrace the concept of office colleagues spending time with each other outside the office itself. That’s great, but where would you go, and why? We propose that for your next business outing, you take your employees on an office hike. Hikes have great health benefits, and having a healthy crew is very important. It’s all about staying in shape and promoting a healthy lifestyle. So what exactly would an office hike bring to the table aside from the obvious team building and fitness benefits? Heart disease is common even in younger people. It’s no longer something encountered only at old age. That being said, it’s important to do whatever you can to prevent tragedies. Hikes help tremendously with forestalling heart disease, thanks to the immense benefits they bring to your cardiovascular system. Extra weight is the source of multiple health risks. However, not only is it a health hazard, but it also sometimes encourages less than acceptable behavior from certain team members. This can happen when someone’s weight becomes the subject of ridicule, either overtly or covertly. One way to prevent these hurtful and improper behaviors at the office is by implementing office hikes. This type of business outing will not only help overweight team members to lose weight, it will also encourage more camaraderie among the entire staff. A united office is a strong office, but it’s up to the leader to find ways of inspiring exemplary office conduct among colleagues. A business outing that consists of an office hike could influence better behavior. If all your employees are unhappy, and there’s an overall sense of low morale at the office, you might be getting a hint as to why this quarter’s numbers aren’t looking so great. People are more likely to be productive and efficient when they’re feeling satisfied and happy. A business outing of an office hike just might be in order. Hiking promotes a more positive attitude. While that’s the case for all types of workouts, hiking in particular not only gives everyone a nice jolt of feel-good brain chemicals, being in the outdoors also promotes an overall sense of well being. Besides, hiking just happens to be one of the best forms of cardiovascular workout. With regular and frequent hiking trips, it won’t be long before your employees punch in looking leaner, and well, just great. Each person will feel better about themselves, and this in turn will boost office morale tenfold. This will have an amazingly positive effect on the atmosphere of the office overall. Furthermore, if your work environment is open to the public, your business will benefit enormously. Whether they realize it consciously or not, customers will be drawn to the happy faces and attractive bodies that will soon populate your office. Instead of the usual boring trip that no one really wants to go on, consider taking your office crew on a hiking trip. It’s good both for physical exercise and promoting camaraderie. Best of all, everyone’s thinking will be clearer, and innovative ideas will come naturally to all team members. It’s difficult to imagine another office outing solution that provides all these benefits in such an exciting and adventurous package. Running your own small business is the life, right? Being in control of your day and your destiny sounds great. That’s the goal and the reason you decide to venture into business on your own, but a new Fundera survey of small business owners reveals small business ownership isn’t for the weak-willed or faint of heart. The life certainly comes with its hardships. And most notable is the lack of pay. The Fundera survey reveals that 30 percent of small business owners don’t take a salary. What that says is, if you’re looking to collect a regular paycheck or you’re dependent on the check you’re getting from your day job, think twice about starting your own business. Of course, if 30 percent aren’t taking a salary, that means that 70 percent are. Running a business certainly won’t leave you penniless, at least if you’re avoiding catastrophic mistakes. But compared to the average CEO, a small business owner’s pay is considerably less. According to Fundera, the national average pay for a CEO is $160,000. Almost 87 percent of the small business owners surveyed told Fundera they take a salary less than $100,000. Even if a small business owner is making close to that $100,000 figure, it’s not without toil. Fundera found in its survey that the average small business owner is working much harder than the average worker. According to the data, 81 percent of small business owners work nights and almost half (45 percent) do so on a regular basis. Weekends are no exception either. In fact, it’s more likely a small business owner will work a weekend (87 percent) and will do so more often (45 percent) than the average worker. The average small business owner, according to Fundera, works between 40 and 49 hours per week. The average American worker clocks in for 38.6 hours a week. For this survey, Fundera partnered with Qualtrics and questioned 409 small business owners and people in positions of upper management at small businesses. MetaTrader 5 is a fairly new, diversified trading software for various kinds of trade, including foreign exchange (Forex) and stocks. It offers a set of high-grade tools that include wide-ranging price analyses, trading advisers, and copy trading. In addition, it makes use of robots for greater speed and agility in the markets. Although the MetaTrader 5 was introduced in 2010, investors and brokers alike have had widely divergent opinions about its advantages and disadvantages. Nonetheless, its reputation is stronger today than ever before. That’s because of its diversified and revolutionary platform, a big change from the MetaTrader 4. If you’re thinking of turning to Forex or other trading as a way of raising money for your startup, this article could be pertinent to your planning. Brokers who prefer MetaTrader 5 claim that a successor to the MetaTrader 4 was a must. For instance, the MetaTrader 5 allows investors to open several positions at the same time. Other new options give the newer platform great appeal, too. Additionally, its simplicity and ease of use have some brokers and investors singing high praise for MetaTrader 5. Investors appreciate the fact that MetaTrader 5 allows its users to work with their preferred strategy on the financial markets, as traders with technical skills can customize the software to suit their own styles. This can be a disadvantage to those who prefer a simpler interface. However, most brokers who rely on the MetaTrader 5 offer personalized services for their customers, so that even new investors can enjoy a user-friendly and intuitive interface. Moreover, traders can take advantage of 4 order-execution modes. Additionally, advanced fundamental analyses let users predict the price of cash flow with the least possible error margin. Then, too, the new platform has an option that allows users to subscribe to the indicator of a particular person they consider to be a model trader. This option alone can give great comfort to someone who is new to the game, allowing them to learn from more experienced investors. Moreover, you can choose to have the software work automatically, even if you’re using only the demo version at first. (Of course, this option extends to live accounts, as well.) However, if you do choose to allow the software to run automatically, always remember that doing so puts you at risk. A reputable broker will always warn you not to rely completely on automatic indicators. Your profitability could be at stake, unless you are very attentive to the indicators you’ve set as well as to the market itself. In order to gain experience and wisdom as a Forex trader, take pains to educate yourself. Learn everything you can so as to become a better investor. Being a passive observer could cost you in the long run. All in all, MetaTrader 5’s useful tools will come in handy for experienced traders. In addition, you’ll be able to access the platform 24/7 from wherever you are. All you need to do is to download the software on your Android or iOS from the official website. Then, find a reliable and secure broker and start testing the new platform for yourself. Despite the fact that the Forex market has continued to rely on the MetaTrader 4 as a market standard, its successor is gaining ground. And it’s definitely worth a try! Why you have to learn to say “no” when you need to. In June this year, the Petya ransomware attack hit businesses, preventing victims from accessing their data until they paid $300 in bitcoin. The ransom ware exploited vulnerabilities in Microsoft systems. Shipping company Maersk was a victim of cyber crime and has said, following the attack, it has put “different and further protection measures” in place. Hacking group Shadow Brokers first surfaced in August 2016, but in April this year the group made its most impactful release yet. The attack comprised of a trove of alleged NSA tools, including a Windows exploit known as ExternalBlue. The Shadow Brokers leak has revitalized concerns of the dangers of using bugs in commercial products for intelligence-gathering. At the beginning of this year’s tax season in the United States, a spear-phishing attack circulated. 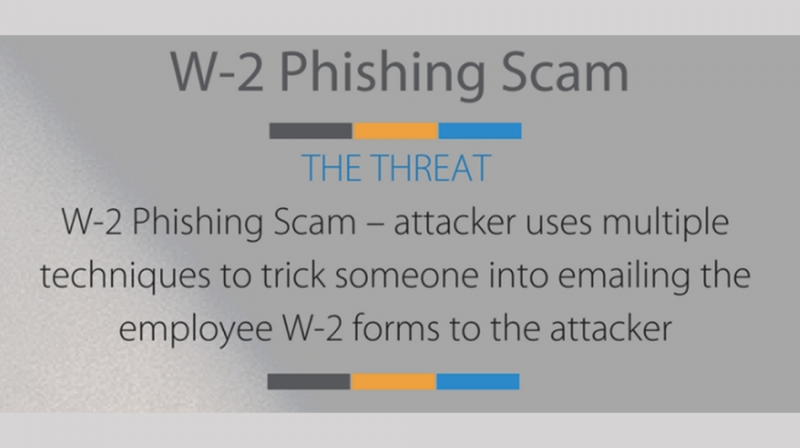 The W-2 Phishing scam involved cyber criminals sending out fake emails. The hackers deliberately made the emails look like they were being sent from corporate executives. The fake emails requested the personal information of employees for purposes related to tax and compliance. By the middle of March 2017, the phishing scam had compromised more than 120,000 employees at more than 100 different organizations. Earlier this year, the Nigeria-based Business Email Compromise (BEC) attack hit over 50 countries, targeting more than 500 businesses, predominantly industrial companies. The phishing scam prompted recipients to download a malicious file. When the file was downloaded, malware would gain authorized access to business data and networks. In February, a group of cyber-criminals in Eastern Europe sent out emails laden with malware to staff of Chipotle. By clicking on the fake emails, the oblivious staff inadvertently enabled the hackers to compromise the POS systems of the majority of Chipotle locations. The hackers were then able to obtain the credit card data of millions of people. In May, more than 3 million workers worldwide were forced to stop work when phishers sent out fraudulent emails invitations on Google docs inviting recipients to edit documents. When the recipients opened the invitations, they were taken to a third-party app, which enabled hackers to access individuals’ Gmail accounts. In the first quarter of 2017, businesses in Qatar were targeted with tens of thousands of phishing attacks in just a three-month period. Qatar’s phishing attacks involved the hackers sending out malicious emails and SMS texts to businesses, designed to compromise valuable information and data. Known as the Amazon Prime Day phishing attack, hackers are sending out seemingly legitimate deals to customers of Amazon. When Amazon’s customers attempted to purchase the ‘deals’, the transaction would not be completed, promoting the retailer’s customers to input data that could be compromised and stolen. So, what’s the morale of the story involving the huge rise in phishing attacks that target small businesses and cause so much destruction? As the consequences for businesses which ignore the security risks of phishing attacks can be disastrous, it is within every companies’ interest to implement solid cyber security measures. Instead of essentially waiting for an attack to happen, businesses need to develop a security policy that becomes ingrained into corporate culture. Part of this culture should be paying extra caution when receiving emails from unknown sources and avoiding opening such emails or clicking on malware-infused links. Country singer Tim McGraw takes fitness as seriously as he does music. His road regimen is a tough routine that can include 30 minutes on the treadmill, an hour of yoga and runs up and down the stairs in whatever arena he’s playing that night. That’s not counting an hour (or even two) in the custom tractor-trailer gym he brings with him, which includes 20-pound chains, exercise balls, sledgehammers and more for a grueling, high intensity CrossFit-style workout. These strategies do more than keep him toned. He says fitness has helped him become more alert and improve everything from his work to his relationships. And since he works out with his band, he’s seen the unique way fitness has helped them all connect, collaborate and work together on and offstage. These experiences, in part, inspired McGraw to help others change through fitness and new habits. The singer has signed a two-year partnership with Snap Fitness to develop a line of specialty clubs. These TRU MAV signature clubs will leverage workouts and custom equipment McGraw uses himself. We caught up with McGraw to learn more about how fitness has transformed everything from how he works to how he leads — and what you can learn, too. Here are some excerpts from our interview, edited and condensed for clarity. Fitness is really a mindset. Tell us about how your mental game has changed. It’s not necessarily about how you look, it’s about accomplishing something. Ten years ago when I really started trying to get myself in good shape, I noticed it raised the bar on everything that I did it: my career, my family life, my alertness. It changed my whole attitude about everything that I do. Finding good habits turned into better habits and finding better habits turned into really, really, really great habits. I think it’s made my career stronger and certainly has given me more longevity. You work out with your band — and it’s brought everything up a notch. How? It’s a great team-builder. We end up talking about the show a lot and talking about different things that we want to do and how we might change the light or maybe change a certain guitar sound. Some of our best ideas about the show come during our workouts. It’s a direct translation to what we do on stage. When you’re out there with a team and you’re pushing each other to work hard in the afternoon, you do the same thing when you’re on stage together. People who start a new regimen can hit a wall and not want to push themselves again. How can they trust and listen to their bodies? The more energy I expend during the day, the better I am at night. I grew up being an athlete — a football player, a baseball player and a basketball player. And your body does that for you. Any athlete will tell you there’s that two to three hours before right before a ballgame where it feels like your body’s crashing and you’ll never get back up. And that’s your body reeling itself in and resting itself. These fitness clubs are a new venture for you. What advice do you have for other people striking out on their own with new ventures? I’ve gotten asked this question by people in the music business, and other artists, people who want to start companies, and it always comes back to focus. The times where I know things are going well for me and I’m making the right decisions and I’m firing on all cylinders are the times that I’m focused. The times when things don’t seem like they’re quite right, where it feels like I’m struggling or like the boats are swaying a little bit, those are the times where I realize I’m not as focused as I need to be. SendPulse is one of the latest email marketing platforms to enter the market. Despite being new and taking on established players in the market, SendPulse has more than 250,000 active users. Notably, these users include bloggers, business owners, marketers, and large corporations. The popularity of this innovative marketing tool can be attributed to the fact that the company provides SMS and web push services. What’s more, these offerings are in addition to their flagship email marketing services. Additionally, all of these services are offered at a highly affordable price. In fact, SendPulse offers a free plan for bulk emailing. Under this plan, users can send 15,000 emails to a subscriber base of 2,500 users. Additionally, there is another free plan for SMTP email service. Under this plan, users can send 12,000 transactional emails. Paid plans start from $9.85/month, making it one of the cheapest email marketing services in the market. Simply put, push notifications are in-browser notifications that you can send to users once they opt in. It’s an innovative, non-intrusive way of engaging subscribers. You can start using this feature with SendPulse as soon as you register for a free account. Furthermore, you can personalize your messages and share information with your users. Your messages can include news, sales, your latest blog posts, discounts, or important event updates. Opting in to receive web push notifications is a one-click process. This is a lot easier than the email opt-in process, which requires the user to enter their email address and sometimes even more information. More traffic leads to more subscribers which in turn leads to more revenue. Web push notifications give site owners the ability to drive traffic by encouraging their readers to return to their website. A key benefit of using web push notifications is that they demand immediate action on the part of the subscriber. You can use this unique functionality to your advantage. For example, you can send instant content through push notifications. Items like breaking news, event updates, and discounts can go out immediately to your customers who have opted in. If you were to share this same information through other channels, it would seem dated to readers who might have already read it on other sites. Sent in the form of a web push notification, however, this becomes a digital nudge, encouraging readers to learn more and return to your website. SendPulse combines two of the most potent technologies, email marketing and web push notifications. Consequently, this powerful combination will help you to increase your subscriber count, drive more traffic and boost engagement. “Buying local” is a major trend of the moment. But it’s more than just a fad. For businesses like local restaurants, using locally sourced food can be a major selling point and benefit. Here are ten reasons why your restaurant should consider using locally sourced food. According to LocalHarvest.org the average distance that fruits and vegetables in the U.S. travel before reaching their final destination is about 1,500 miles. So when you buy items from large distributors, you’re probably getting something that was grown, picked and preserved to make that journey. But if you buy locally, you can get items that were just picked, so they’re much fresher and more appealing to customers. Because local food doesn’t have to go through all of that travel or need all those preservatives, it’s often much better for the environment. This can help you lower your business’s carbon footprint. And it can also lead to some decent PR for your business. When you buy from local farms, you’re more likely to get organic food products and products made without tons of artificial substances and chemicals than you would if you were to buy from large distributors. This often means that the food is more natural and healthy, allowing you to easily appeal to the growing base of health conscious consumers. Buying from local farms means there’s more money going back into your community. Researchers at Penn State have found that this leads to higher income per capita, meaning a stronger local economy and potentially happier consumers. Buying locally can also help you build connections within your community. When you buy directly from farmers, you can work with them one-on-one and then build relationships over time. This can lead to a great working relationship that might lead to even more opportunities for your business and community in the future. Which item would you rather order: “Pork Chops and Applesauce,” or “Schneck Farms Center Cut Chops and Jersey Acres Red Delicious Applesauce?” Adding that local flavor to your menu can really appeal to customers and make the experience of dining with you more memorable. It connects your customers with their dinner and your restaurant. Your products begin to tell a story. When you buy local food, you do have to keep the seasons in mind, because local farmers will only have the ability to grow certain foods while they’re in season. But that means you can change your menu with those offerings, offering specialty items that are only available for a limited time. According to the National Restaurant Association, 57 percent of adults say that they look for restaurants that serve locally sourced food when dining out. Since that’s something that customers actually go out of their way to look for, it can be a great way for you to market your business and add value to the customer experience. But it’s not just local consumers who love to see local food on the menu. If your restaurant is in an area that’s popular with tourists, having locally sourced food on the menu can help you appeal to those visitors who want a unique and authentic food experience. While you might think that sourcing food locally is expensive, it isn’t necessarily as big of an obstacle as you might think. Since buying locally often means working directly with farmers, you have shorter supply chains which can help you save money. And studies from Nielsen and others have found that consumers are usually willing to pay more for food items that they perceive to be healthy or locally grown. Traditionally, plans for brick-and-mortar stores are developed through physical prototyping. But when prototypes aren’t right, need to be revised or they’re no longer needed, they’re often thrown away or their materials are recycled. It not only costs money and takes time to have them built, but it’s also not efficient from a resource standpoint. TreeHouse used to operate this way a couple of years ago. The home-upgrade retailer, which positions its offerings as “healthy and sustainable” alternatives to those found at Home Depot and Lowe’s, treated its first store, located in Austin, Texas, like a “petri dish,” says TreeHouse’s vice president of creative and design, Aaron Moulton. They’d use it to run pilots of store displays, and then a week later, the display would be tossed. “That went on for about two months, and we went, this is kind of ridiculous, this feels like we’re doing something wrong that’s against the soul of the business,” Moulton says of all the waste. So, they decided to change up the approach to developing its stores. They knew very little about the technology or where to start, but they understood that they would need software to help with modeling architectural interiors, as well as hardware, meaning VR headsets. They also knew they’d need to somehow translate models into VR. It was around this time that Moulton attended the Dwell on Design interior design conference and met some of the team from architectural VR software startup IrisVR. Their platform was exactly what TreeHouse had been looking for in a VR player. It hadn’t launched publicly yet, so TreeHouse got a private beta. The platform allowed TreeHouse to drag its architectural model into VR directly, Moulton says — in less than five minutes. It was super simple, and didn’t require Treehouse to hire a VR designer, which obviously saved the company money. For instance, during this process, TreeHouse revised plans for a staircase to the mezzanine level. The originally plan was a dense steel and wood structure, meant to evoke the interior of a tree. By using VR, the company found it blocked windows, darkened the store’s core and impeded the natural daylight that illuminates the space and minimizes electricity use. 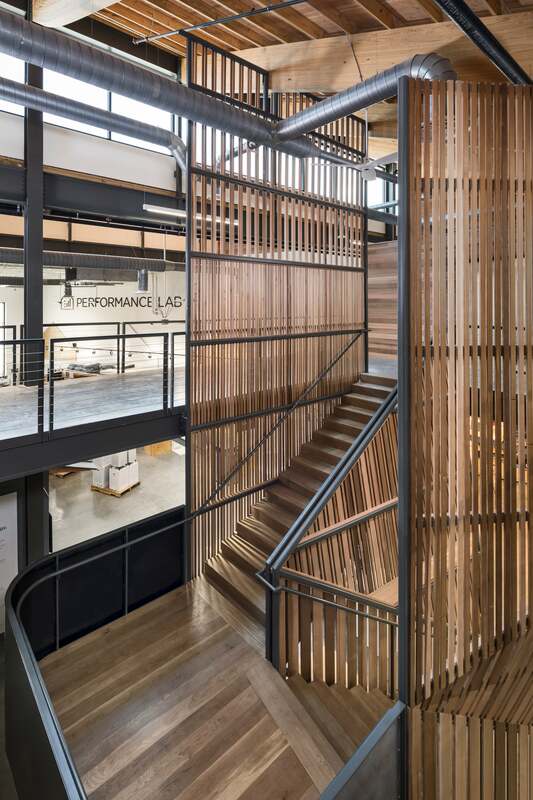 Today, the walls that surround the staircase are made up of vertical wooden slats, space apart to let in light. The company estimates it saved $50,000 building a simpler structure, as well as another $20,000 or $30,000 removing some unnecessary walls elsewhere in the store that made the space feel too enclosed. TreeHouse is currently planning a third store in Plano, Texas, and while plans aren’t finalized, the goal is 50 stores within the next 10 to 20 years. Moulton says that the company plans to model all of its future stores in VR, and believes by doing so, the company will save tens of thousands of dollars a year now that it won’t have to hire teams to build prototypes. Also, CEO Jason Ballard won’t have to travel to different cities to tweak displays, further minimizing the company’s carbon footprint. Another advantage of VR modeling allows is customer feedback. Pre-VR, TreeHouse couldn’t have expected regular customers to join them in their conference room and mark up blueprints. But to date, the company has pulled three people from the store floor and invited each of them to don a headset and share their thoughts on planned store displays. Going forward, this one-on-one interview approach will give TreeHouse direct insights into how its customers think and shop. 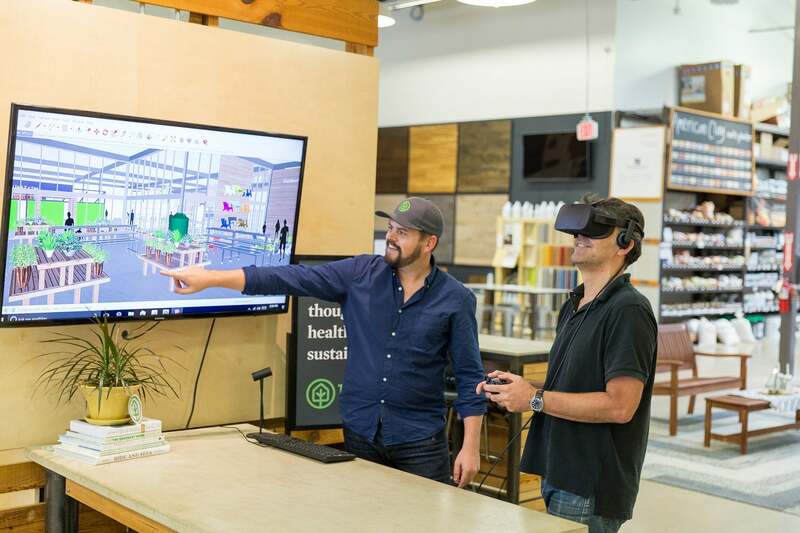 Aaron Moulton (left), vice president of creative and design at TreeHouse, helped spearhead the company’s transition to using VR for store design.